The Senate approved fast track for the Trans-Pacific Partnership (TPP), giving Obama authority to negotiate. It has to be approved by Congress still. On this topic, it is interesting that it is the first time Krugman came out (or here), as a closet 'protectionist', and was against a Free Trade Agreement (FTA). Note that the reason for his Sveriges Riksbank Prize (aka Nobel) was: "his analysis of trade patterns and location of economic activity." His contribution to the analysis of trade patterns was essentially to introduce imperfect competition in the mainstream trade model. And actually what introducing imperfect competition in the mainstream Heckscher–Ohlin-Samuelson (HOS) model (the limitations of that model were discussed here before) did was to suggest that under certain circumstances trade management might be a good idea. He edited later a book, Strategic Trade Policy and the New International Economics, in which some more vocal defenders of trade intervention were present (I'm thinking of Laura d'Andrea Tyson, and John Zysman, at least at that time, in the early 1990s). But he remained committed to free trade (he wanted the 'Nobel' badly, is my guess). The logic, presented in his paper "Is Free Trade Passé?" (subscription required) was that free trade was a simple rule, while trade management was too complicated, so even though policy might be required, Occam's Razor suggested that free trade was a better choice. So Free Trade was not passé after all. Note that this is a bogus argument, since trade, even with FTAs is always managed to some degree. Sanitary rules, defense preoccupations, and so on, imply that barriers to trade are usually imposed. The problem is not the complication of managing trade, is who benefits from the rules imposed (cui bono). FTAs favor corporations, mostly in advanced economies. "the Pacific trade deal isn’t really about trade. Some already low tariffs would come down, but the main thrust of the proposed deal involves strengthening intellectual property rights — things like drug patents and movie copyrights — and changing the way companies and countries settle disputes. And it’s by no means clear that either of those changes is good for America." FTAs allow greater mobility to capital, provide all sorts of protection to corporations in terms of ownership and access to courts, at the same time that it limits the abilities of national governments to intervene. However, one of the central things that government should be able to affect is exactly was is locally produced, and what types of jobs are generated as a result of these interventions. Industrial policy is intrinsically tied to commercial policy. On this Krugman remains as conventional as he can be. He avoids telling you that trade has negative distributive effects, and that it might negatively affect industrial employment, and potential growth. For him, the only reason that TPP might be bad is that it may reduce access to cheap medicines in developing countries and make financial reform more difficult in the US (both true, by the way). Why you ask free trade would not be bad otherwise? In his words: "because, whatever you may say about the benefits of free trade, most of those benefits have already been realized." So there you have, Free Trade already worked, and one would assume it has not been part of the forces that weakened labor bargaining power in the US, according to his views. Or if it was, it was fine, since overall free trade was beneficial. To whom is not a question. And ask the people in Mexico, left with a pattern of specialization that only allows for the exports of people, directly through immigration or indirectly through maquilas, how much NAFTA has benefited them. The notion that free trade, free markets in general, produce somehow optimal outcomes is a crucial fetish of mainstream economics. And Krugman is very concerned with being taking seriously, and not violating the accepted totem of the profession. As he says it is possible for: "reasonable, well-intentioned people [to] have serious questions about what's going on [the TPP negotiations]." Yes, he still believes in free trade (is not passé and the benefits have been realized), he is 'reasonable, and well-intentioned,' and has 'serious questions.' 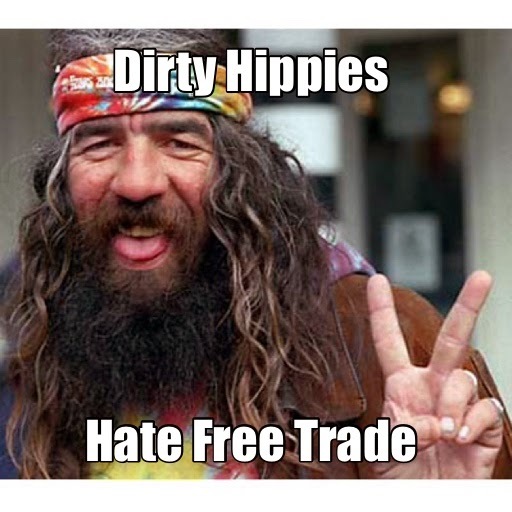 Not like those dirty hippies that think free trade has no rigorous intellectual foundation.